On Friday 22nd of March, thirteen of our 6th class pupils celebrated their Confirmation Day.Those pupils were as follows, Holly Byrne, Jack Coogan, Conor O Sullivan, Bobby Brennan, Niamh Meagher, Patrick Coughlan, Leo Downey, Mark Kennedy, Josh Kirwan, Adam Nash, Eamon Brannigan, Cathal Dunny and Will Tynan. 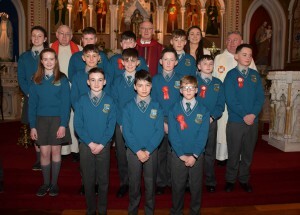 Bishop Dermot Farrell joined us all in Castlecomer Church on what was a wonderful occasion for all. A huge congratulations to all the students and their families. We hope you all had a very special day!